Ewwwww... Now WHAT was that? Someone care to parse this one? Somehow I see Armenia and think Vulcan. It's all blasphemy. All of it. Sorry I HAD to grumpycat this. Not mocking you or anything it just goes with this cat so good. I actually like the style of this, whatever it may be. Looks like a Christianized version of a Socialist Realism mural. This is an Armenian icon, or more accurately, a small portion of a very, very large iconographic tapestry in Etchmiadzin. At the top is the traditional Armenian symbol of the letter Eh, standing for "I am," or "He Is." The main scene depicts the Holy Translators, Ss. Sahag and Mesrob. St. Sahag is holding the open book, St. Mesrob is at the forefront, holding a tablet with the inscribed Armenian alphabet. The style is typically Armenian to my eyes, nothing out of the ordinary. I would like it a lot more if it wasn't so "busy". There's just way too much going on there to keep track. I appreciate much of George Kordis' work. The top example for instance. The panel icon below it doesn't do much for me. Khandjian's tapestry was never meant for veneration. It isn't an icon per se. I have seen it in person and it really is a magnificent work. I've had a look at his works on his site, and his work varies in quality and artistic style. Some of the work has a distinct Stamatios Skliris influence in the oversized eyes, often with a deer-in-the-headlights look. The animation is simply overdone. Everything looks like it's moving in the wind, there is a distinct lack of stillness in a great deal of his work. It gives the impression of disorder, rather than lightness. The above Meeting of the Lord shows the infant Christ dressed in the red and blue garments associated with His adult portrayals, and not in the white or gold (or both) garments which have been consistently and unvaveringly used in the icons of this feast. I find the looks in the eyes of the figures quite disturbing and unsettling. Surely he could have chosen a better background color! That magenta is just horrible and sickly. I also have a problem with the Gerontissa, also known as Abbess of Athos, where the Mother of God is vested in a bishop's mantle. An abbot of archimandrite rank may wear a mantle similar to that of a bishop, but this mantle does not have the stripes, and the panels usually bear crosses, not the four Evangelists. By contrast, the mantle of an Orthodox abbess is plain, without the three horizontal stripes or the four rectangular panels. When an abbess blesses, she arranges her fingers in the way one does when crossing oneself. The IC XC hand configuration (as shown in the Gerontissa) is to be used only by male clergy of priestly rank and above. The Gerontissa ascribes a rank to the Mother of God which is completely at odds with what the Church teaches about her. She is not, nor ever was, a priest, deacon, bishop or abbess. The second work is more acceptable, as she is shown as a lay eldress (which she was, the Apostles sought and valued her advice and counsel) not as a cleric, and patron and protector of Athos. It would have been proper to show Christ somewhere, such as in the upper border of the icon. The general style and peoples' expressions brings to mind Alphonse Mucha's post-Art Nouveau era non-commercial work. I don't know if the style is exactly the same (will have to look up specific examples of Mucha's work to jog my memory), but evokes the same feelings. It also reminded me of Secession. Someone get them a Kleenex! Or a box of them! They're about to cry buckets! The artist should give up his anime habit. It's unhealthy. Exactly. And I know it will sound kooky but in a real picture of Jesus or the Theotokos there is a certain recognition that 'it is them' in them, which these don't have. They do not register as Jesus and the Theotokos in me at all. And this one, of St Gelasius the Mime. The saint's right hand is showing reverence and deference to his actor's mask. Nice. And the colors just speak of fairgrounds, circuses and pantomimes, cotton candy for hair. And we're supposed to take the clowns who paint such images seriously? How dare they do that to my patron saint!! I wish their bishops would haul them over the coals, and order their sacrilegious bunk destroyed. I like the picture of St. Justin. I'm not exactly convinced that it is an icon but I like it as a painting. Thank you for deleting the link to my URL. I probably didn't express clearly that the issue I had was not with the use of my pictures as much as it was posting a link to my personal blog and the comments unrelated to the pictures themselves. I apologize if the gifs I made offended anyone. I'm not sure what you mean by report? At this point I wonder if it would be better for us all to just move on however seeing as how I have seen an enormous disagreement in regards to the digital alternation of icons, it may be worth discussing (though this topic might not be the place). I was thrown by what Carl posted, until I realized he'd made a typo: report instead of repost. She is the Mother of God, Holy of Holies, the Mercy Seat and Queen of Heaven. She's higher than any Priest or Bishop. I don't see any issue with it, especially if we put a crown on her. 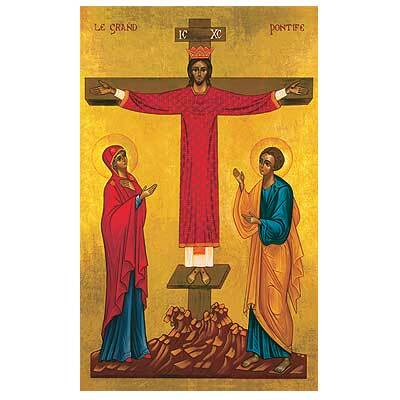 This image by Sr. Marie Paul, OSB, is a synthesis of two classical icons. The first is the Crucifixion; the second is Christ the High Priest. The Crucifixion image has been used from earliest times. 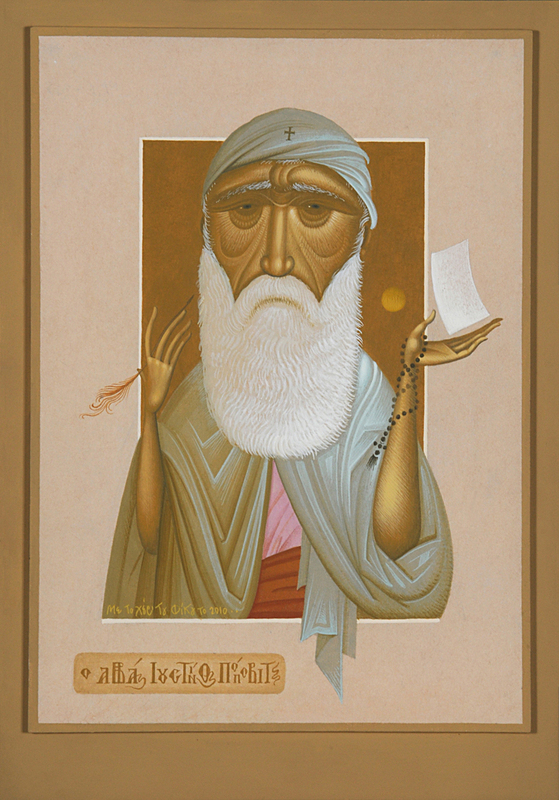 A lesser-known icon is that of Christ the High Priest. The depiction originated in the Balkans in the fourteenth century and spread throughout the Orthodox world. Christ is shown on the cross fully vested, both Sacrifice and Intercessor. He is flanked by Mary His mother and St. John the Evangelist. Would this fall under shlock? There are depictions of a clothed, though not vested, crucified Christ in catacomb art and in some early manuscript illuminations, but, very quickly, this form of depiction disappeared. Given that the iconography of the Crucifixion and of the Christ as High Priest have remained resolutely separate for so many centuries, I would put this image down as being honestly misguided. But the absence of any halo around Christ's head is a fatal omission, rendering this image completely unsuitable for veneration. I came across this antique icon on Ebay, and I'm wondering what's going on here. It clearly depicts the Father and the Son, and the Holy Spirit as a dove above the Son, but then who is the angel? Is it supposed to be a second representation of the Spirit, or something else? Two possibilities come to mind: Either St John the Baptist, as he is often shown (in error, I'm afraid) with wings, and he is gesturing to the "Trinity"; or, less likely, Holy Wisdom. Whatever the true answer, this painting is quite unsuitable for veneration for a variety of reasons. Christ Holy Wisdom is an uncanonical, but sadly common, depiction of the pre-incarnate Christ, as a winged androgynous figure. Wisdom "icons" appeared in Russia in about the 16th century, along with a number of other compositions which are contrary to Orthodox doctrine and theology. What is the wooden object they're all three holding? I assumed it had something to do with divinity. The wooden staff is likely a staff of authority, a bit like a king's scepter, and is a common motif in non-Orthodox religious art. If so, it makes the presence of the winged figure all the more confusing theologically, as he is holding the same type of object as the Christ and Father figures. Orthodox icons of angels show them bearing a long, spear-like object, which is a messenger's staff (angelos = messenger in Greek), as they act on behalf of the Heavenly King. The whole image is kind of weird, with the Holy Trinity and their friend Ron looking into a palantír at naked Adam and Eve. You cannot hide. I see you. ^ Points for sheer rarity of subject! As a stand-alone icon, completely impossible to venerate because of the lack of saints or holy ones in the composition. At least Judas Iscariot (on the left, dark hair and beard) isn't shown with a halo, thank God. This image would only make sense if it were a panel in a larger icon featuring other Holy Week scenes surrounding a central panel of either the Crucifixion or the Resurrection. But the narrow red and greenish border confirms it is a stand-alone "icon". Weird.